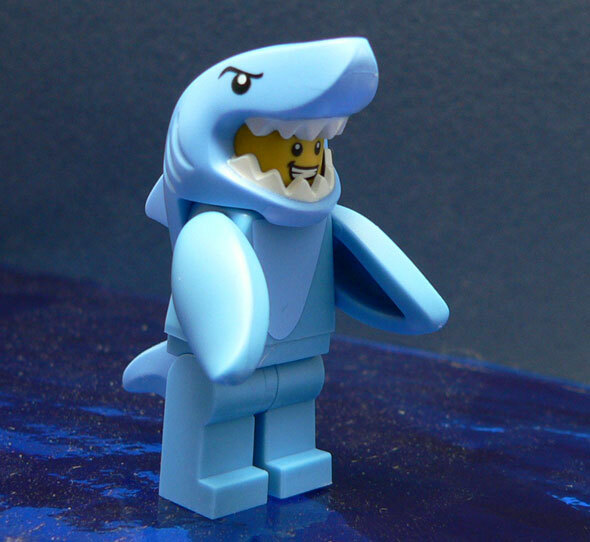 I love the Lego mini figures of people in crazy suits. Chicken suit dude, Hot Dog Guy, Panda Dude, Bumblebee Girl, Clarence Beeks. Those are the ones I seek out first. Anything else is gravy. 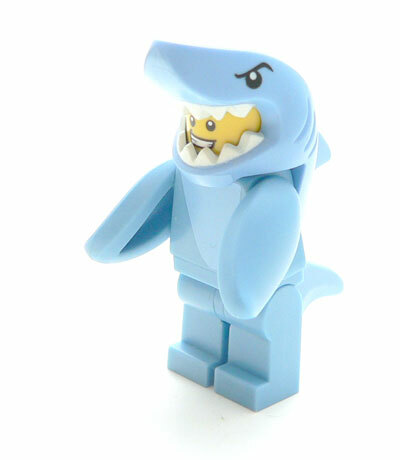 So you know when I saw the new series, I’d have to look for the Shark Suit guy. Now I know everyone is probably thinking something different. Katy Perry’s Left Shark. Candy Gram SNL Shark. Snickers commercial “Steve was delicious” shark. But for me this is a Jimmy Buffett tribute shark. 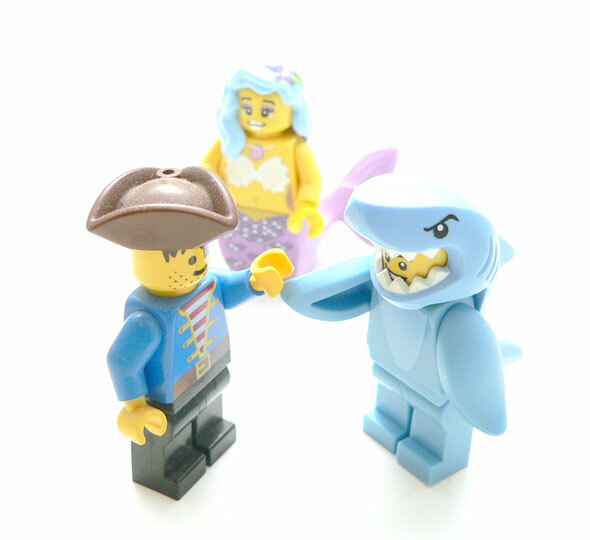 If you aren’t a Parrothead, you may not be familiar with the chant of “Fins up!” and required calisthenics required when the song “Fins” is played. I’ll put a video at the end for you guys. If you wondered where “Landshark Lager” got it’s name, now you know. And know is half the battle. Anyway. I took a guess at which of the bags in the dump bin was the shark. The top of the head is flat, and is a long piece with the tail attached. It’s one of the easier to feel for. I normally miss on the first one I get of a wave until I can get the picture sheet of all of them for my wallet. This dude is molded in a pale blue. All the pieces except the head are the same. The body is sparse on paint except a light blue patch for his belly. However, like most Lego designs, less is more. The body and legs are normal, but the arms aren’t. He gets a couple of long fins in place of his arms. Their cool. They look interchangeable, as well. The masterpiece for this guy is the head. The face shows through the open mouth with it’s rows of teeth. The piece is style so minimally, but there is no doubt what it is. 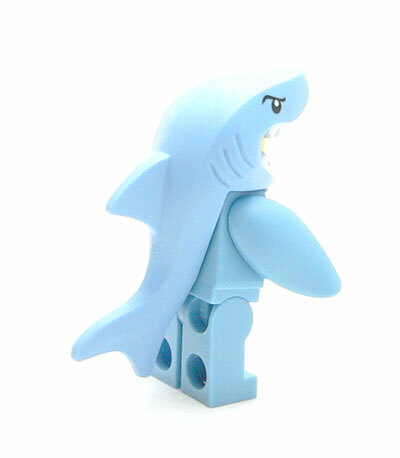 It goes down his back with a fin and a tail. There are some subtle gills on the sides, and of course some great painted eyes. What surprised me the most is the head has two faces! Of course, I’ve seen Lego figures with two faces before. I just didn’t expect it here. One is a classic, “How you doin?” face and the other is a frightened face. I’m not sure why the guy in the suit would be frigthened, he’s a shark! Still, it’s a cool detail. What else can I say. I just love the fact when you think Lego couldn’t possibly come up with anything cool that is new, they do. And they just keep going. Well done!